but this style only affects the top-level item that has the @defer tag, not the child items. Although the overall project is muted, it still takes up quite a lot of space. It would be nice if I could apply styles to a node based on the tags on its parents, but it sounds like that’s not possible right now. Even if I could, it still takes up a chunk of vertical space in the outline. I could add the @defer tag to every sub-item. Then I get the styling, but also lots of extra tags I’d have to add and remove. I could fold the deferred project. Then it’s easy to toggle the visibility of all the sub-items, and I save that vertical space. But when you close and reopen a document, all the items are expanded – whether or not they were collapsed when you closed the document. So I wrote a script that walks the outline, and collapses any task it finds with the @defer tag. I have this set to run whenever I open TaskPaper, so my deferred projects are collapsed by default, and I selectively expand them – not the other way around. This approach can be generalised to auto-collapse tasks based on other conditions – change the if (project.hasAttribute("data-defer")) condition to a different check. For example, I have some projects that I can only work on during weekdays, so I’ll probably write a modified version of this script to collapse them on weekends. I am slowly dipping my toe into the water of TaskPaper scripting, so this is quite a simple first entry. Hopefully some more interesting stuff soon. The master version of this script is on GitHub. This is a great idea! How would I change the code so that anything with child tasks collapses if it’s tagged @defer? Sorry, I think I’m a bit tired, and I’m not entirely sure what you mean. Do you mean collapsing the child items of any tasks that have the defer tag? Okay, I didn’t test this script, but barring some spelling error, I am assuming it will work. Let me know if it doesn’t. Somebody who knows more about TaskPaper scripting than me may know a better way to get all the items in the document. removing or adding types as you see fit. You both are brilliant — thanks! Nice! How do you run it whenever you open Taskpaper? FYI, I think that you missed that “project” since I am thinking you meant “item”. 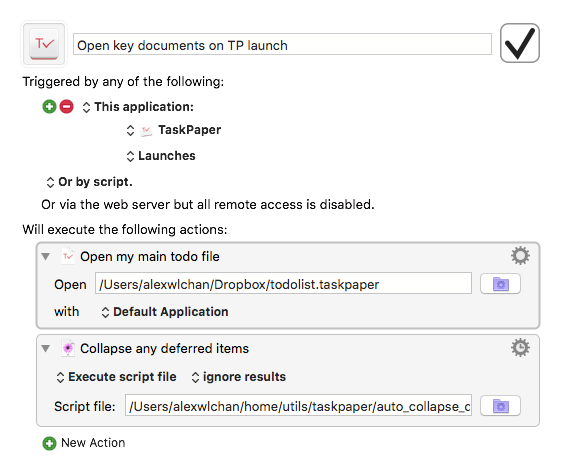 How do you run it whenever you open Taskpaper? An “Open a File, Folder or Application” step that points to my master todo list.